As far as proverbial phrases go, they say ‘the early bird gets the worm,’ but for this house on Robin Road in Milwaukie, it’s also a bit of ‘the third time’s a charm.’ If we mix these phrases together, well — the third birds get the worm. And those birds in this case are my clients Erik and Samantha – a determined and savvy young couple on the hunt for their first nest. I met with them in the early fall, in the aftermath of a transaction gone sideways with another home and another agent. They needed a fresh start, and they knew exactly what they were looking for; specifically, a two-car garage, room to park a boat someday, never a split-level home, mid-century through late-90s, somewhere in Milwaukie or Oak Grove, clear communication and transparency from me, and a strong sense of understanding their rights within the overall process. Not a bad wish list, and I was certain we could make it happen. Erik works as a financial auditor and Samantha as a mortgage industry professional. I couldn’t have asked for two more appropriately skilled clients to have as partners in this transaction. Firm and clear goals, detail-oriented, strong advocates and solid negotiators, but also flexible, kind and understanding, as well. That’s a great combination to possess in a home-buying transaction. I had seen this sweet house on Robin Road over the summer for some other clients who never ended up touring the home. 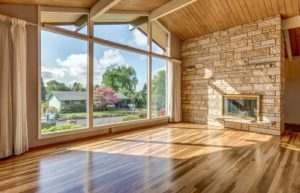 Even then, I was a little in love with the place – a sun-drenched and large mid-century modern perched on a small hill — with views to the west hills of Portland – and I really wanted to get inside to check it out. It had been under contract twice since April, with nearly $50,000 in price reductions, yet it remained on the market into late October. Turns out that it was the second-to-last-house Erik, Samantha and I saw on our one day of touring together. I was already feeling good about the place, and for me it was love at first sight. I think Erik and Samantha felt the same, even though it was more house than they were expecting. But it really is the perfect house to grow into, with four beds, three full baths and 2800sf — with a massive, daylit basement kitted out with second kitchen potential. It also has the requisite boat parking, a two-car garage, and it definitely wasn’t a split level. We returned the next day for a second visit with their parents, and learned the best part of this whole story: Erik’s dad grew up just two blocks away and attended View Acres Elementary just down the street. AND, they even have family friends that used to own this very house! Too many coincidences and good omens…it was a done deal, and we made the offer the following day. 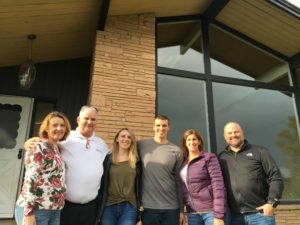 In the end, we were able to negotiate a sales price less than the listing price, as well as obtained a new tear-off roof, a new radon mitigation system, and closing cost credit concessions from the sellers. There are so many things I love about this house, and I’ve enjoyed every visit over the past 30 days. Erik and Samantha are the perfect ones to buy this home, care for it for years to come, and continue the family history in the neighborhood. It’s been so great working with them through the process, and I can’t wait to hand them the keys to their first nest later today! My clients are always my top priority, and my singular focus is to help them achieve their goals efficiently and effectively. This is the intention I set every day, and how I define success. As a trained and licensed attorney, I lead with a sharp attention to detail, a keen ear and focused voice, and an unwavering commitment to integrity, transparency and responsiveness. I’m a passionate advocate and I thrive when helping others succeed, and I’m always available to connect over a cup of coffee to learn how I can help make good things happen. Read my client reviews here. The choice to become a real estate broker was a joyful combination of two very different careers. Prior to moving to Portland in 2008, I was an environmental and title closing attorney in Massachustts. Since then, I've served as a program manager and fundraising professional for Portland-based non-profit organizations Friends of Trees, The Freshwater Trust and Ecotrust. While not scouting homes and helping clients, you can find me riding and racing bicycles, digging in the garden, practicing yoga, experimenting in the kitchen, and exploring the stunning beauty of the Pacific Northwest. Please let me know how I can help you or someone you know. Thank you!